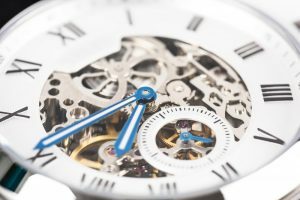 How to choose a good skeleton watch that won’t break your bank? Skeleton watches have a certain charm to them. They show the beauty, elegance, and complications of their interior movements. Design-wise, watchmakers have the freedom to choose which parts of the movements they could show, adding variety to skeleton watches. Through this, they become not just timepieces, but also pieces of art. This list consists of the best skeleton watches under $500 for men, tailored to make your buying efforts a little easier and simpler. They include multiple watches with unique styles fit for the different tastes of people. These are all bestselling models and are chosen from hundreds of customer feedbacks, watch blogs, and reviews so you can rest assured that these are all highly-rated. 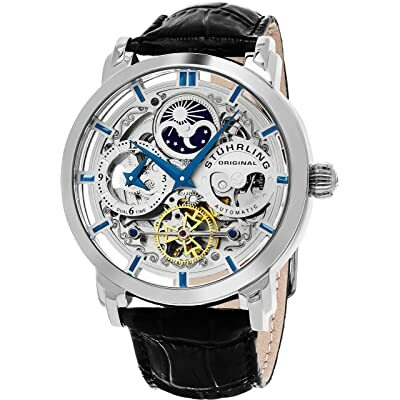 A relatively young yet robust company, Stuhrling offers a unique and charming skeleton watch in the form of the 371.01 Legacy Watch. It immediately impresses with its looks and is easily noticeable, definitely one for the looks. The design of the 371.01 Legacy is definitely eye-catching. It demands attention and shows off its elegance through its four windows. Exuding luxury and vibrancy, the color scheme is silver for the dial and the stainless steel case with blue for the watch hands. A brown leather strap finishes the look and completes the set of the timepiece. A reliable 22-jewel automatic movement powers the watch. For the dial, a durable and relatively sturdy Krysterna crystal protects the timepiece as it shows off its interiors. These crystals are used both on the front and back side of the timepieces, emphasizing the beauty of the skeleton watch. If you want an attention-seeking timepiece that is definitely unique yet elegant at the same time, then the Stuhrling Original Men’s 371.01 Legacy is perfect for you. It is definitely a dress watch that can complete a style you’re going into. It fits formal and semi-formal occasions with its design and tones. It is also quite a large watch, so anyone who prefer this type or those who have larger wrists may find this very fitting. With its features, it also fits its price tag that is priced at the middle range for watches. Another offering form Stuhrling, is the Delphi 730.02. This is another great skeleton watch from the brand. This particular timepiece is a more organized design with the time markers clear and the skeleton shown at a concentrated opening located at the middle. For its design, the Delphi 730.02 features a stainless steel case and a rose-toned hands and markers for the time. The band is made out of leather as well and is brown-toned. Overall, it provides a simpler style compared to the371.01 Legacy, and is more formal in its looks. It is organized and is easy to read. 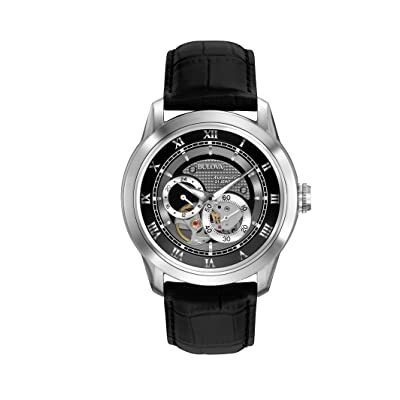 The Delphi 730.02 is powered by the ST-90050 caliber, a 20-jewel automatic movement. This gives the timepiece a relatively reliable movement for timekeeping. The outer minute dial has 24-hour markers for showing military time. It is protected by Krysterna Crystal for a sturdier timepiece. If you aim for a simple, yet classy-looking skeleton watch, then the Stuhrling Original Delphi 730.02 is a great choice for you. With an overall pleasant, complementary, and elegant look, this timepiece attracts ample attention to its unique details and features. It provides a fresher and earthier color scheme that shies away from the usual blue, black, and silver tones. It is a great combination for brown, black, and silver. As a dress watch, it is perfect for both formal and semi-formal gatherings. 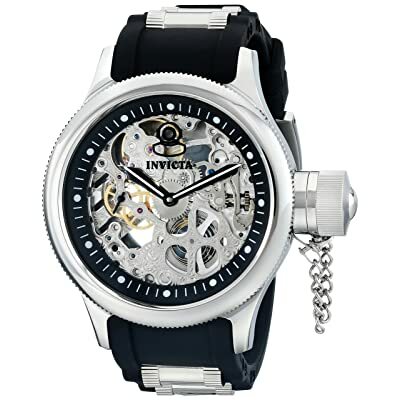 An offering from Invicta, the 1088 Russian Diver’s Watch is an example of a rugged and stylish skeleton watch. It is well-designed and takes the form of an athletic timepiece, which can also be used on daily travels or informal events. Its design is also very aesthetically unique, effectively making it an eye-catching timepiece. The design of the 1088 Russian Diver Skeleton Watch follows two tones for its overall looks. The black tones, featured at the band of the watch and located at the dial markers and hands, create stark contrasts which make time easier to check. The stainless steel case and its metallic interiors finish the complementing looks. For its movement, the 1088 Russian Diver Skeleton Watch is powered by 10-jewel Sea Gull 3600K. It is a reliable caliber that runs accurately and is capable of matching Swiss-made standards. A durable synthetic sapphire crystal protects the dial and the skeleton of the timepiece. If you’re into the rugged looks of a timepiece and want a simple color scheme for a skeleton watch, then the Invicta 1088 Russian Diver’s Skeleton Watch is a great choice to consider. Mixing the complexities of the interior of the timepiece and the simplicity of its design, the watch is definitely a unique and interesting timepiece. It fits most outdoor activities and informal events, making it a great go-to watch. 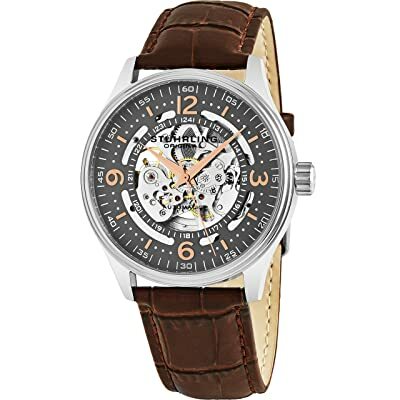 A true skeleton through its looks, Fossil’s ME3041 Townsman is a transparent and sophisticated timepiece to look and to wear. It builds up its looks on its deconstructed form and bares its interior works to create a beautiful and eye-catching design. The look and feel of the ME3041 Townsman is very classy and bare. It hides nothing and emphasizes its interiors through its mineral dial window. It has slight color tone variations with silver for the stainless steel, rose pink for its hands, and black for its leather band all come together for a complementary look. The emptiness of the dial’s sides is filled with markers for the time. Featuring a 20-jewel movement, it provides a reliable automatic movement that is also seen through its internal design. This transparency is made possible by the protection and cover of a mineral crystal. Its bezel is stationary without any design, further emphasizing the beauty of the timepiece’s skeleton. 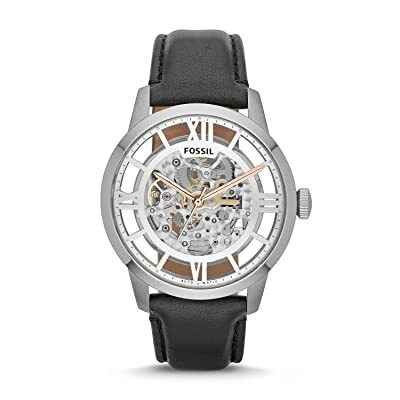 If you opt for a bare yet elegant-looking skeleton watch that you can bring to important social affairs or semi-formal events, then the Fossil ME3041 Townsman Skeleton Watch is for you. It features a transparent design and a silver tone, giving attention to its dial. This bareness, coupled with the complex interiors, make it a more interesting timepiece to use that is surely eye-catching. An elegant and sophisticated skeleton watch, Bulova’s 96A135 BVA Series 120 is a classy timepiece that exudes an air of royalty with its design and color scheme. This timepiece shows its interiors with an open heart at the middle to allow transparency while retaining a level of design for the dial. The overall look of the 96A135 BVA is heavily influenced by the dial, with black and silver tones at different areas. A stainless steel case and a black leather strap complete the timepiece. This is a watch that is perfect for casual to formal events. It is also not that hard to pair up with. As it sports neutral colors, it can fit any style you may have. The movement for the timepiece is at 21-jewels mechanical automatic, which is relatively reliable. The dial is protected by a mineral crystal, giving it some resistance against scratches. The bezel is stationary and adds character by giving focus to the dial. The look and design of the Bulova 96A135 BVA Series 120 is essentially classy and elegant, bringing a sense of style to any type of clothing you wish to wear. This timepiece is excellent for you if you like that flexibility and feel. Because of its color tones and simple dial design, it fits most style options you have and is rarely hard to pair up with. A simple yet classy timepiece, the Seiko SSA231K1 is an everyday timepiece. It can be bought on a lot of everyday trips. Its charm lies on this simplicity that doesn’t make it too hard to match with everyday clothing. A skeleton watch that exudes a simple look, this is an attractive and complementing accessory. Please note that it’s an open-heart timepiece, it just shows a little part of the movement inside. The design and overall look of this watch lies on its essence as a classy and simple timepiece. This character is expressed through the silver case and white dial, perfectly matching the brown leather strap accompanying it. 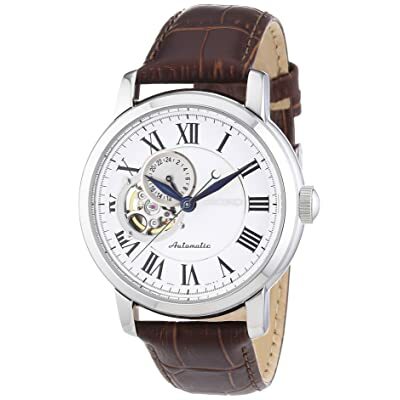 The Roman numerals combined with the white tone of the dial gives it a classic look and an air of elegance. Together, they make a combination that harmonizes with most style options. The Seiko SSA231K1 has a 24-jewel movement from the 4R39 caliber, ensuring a reliable and accurate timekeeping. The dial is protected with a Hardlex crystal, durable against scratches. For the bezel, it is stationary, a fitting choice that lets the user focus more on the overall look and the dial instead. If you want an everyday watch that you can bring anytime and in any occasion, then this is the perfect timepiece for you. The Seiko SSA231K1 Automatic Watch is a simple and classy timepiece that complements everyday clothing. It can be brought on any occasion as it has neutral colors, so any style or color you prefer would be matched effortlessly. Skeleton watches for men have taken style to the whole new level. This kind of wristbands focus only on the essential parts and reveal them through the front section. Gears, bridges, wheel perform, nothing is hidden from the owners! A good skeleton watch can cost a fortune depending on the design and features. However, there are ways to pick a good one without breaking your bank! Features are the first and foremost element you should look at when you want to buy a good skeleton that won’t break your bank. Why? By selecting carefully which features you need and which you don’t, you can save a bit of money. 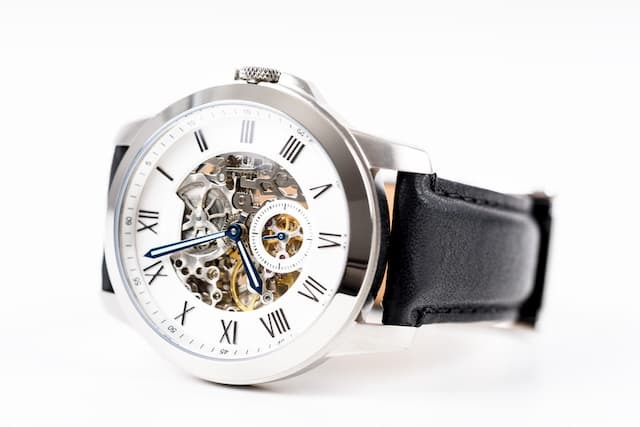 Most skeleton watches will include automatic movement, compass or chronometer. Some will even have advanced functions such as night-vision, distance measuring and more. Skeleton watches are divided into different forms. Each is suitable for different financial condition and social occasions. Here are what you need to know when it comes to styles. Size: Skeleton watches come with different sizes. Remember that size could make a significant difference in your overall look. Your task is to find a watch with a suitable size. Shape: Again, skeleton watches offer different shapes, such as round, oval or rectangular. Use the form that speaks your personality. Material: The most affordable and durable material is metal, for example, stainless steel or titanium. Color: The idea that men should only choose black watches is out of date. There are more cool colors to choose from nowadays! Strap: I would recommend mental straps for skeleton watches. This is the last warning. Skeleton watches could be expensive. Therefore, it is always better to have a fixed budget in mind before shopping. Having a fixed budget helps you navigate your search easier. Take Amazon for example. You can find skeleton watches as cheap as $15 and some as expensive as $10.000. How could you narrow down the list if you don’t start with your price? So start with a price you can afford. Maybe if you stumble upon a model that is a less wallet-friendly, you will be able to restrain yourself. These affordable skeleton watches are the best for the buck. They are not expensive that only a few would be able to afford them, and also not cheap so that the quality and its craftsmanship might suffer. You can also count on them that they are from trusted brands, ensuring that you can wear them with confidence that whatever you choose here is surely a well thought up choice without the need to overspend.